Welcome back to Controversy in Fiction, part 3! You can check out my previous posts: Banned Books and Censorship by clicking on the links. 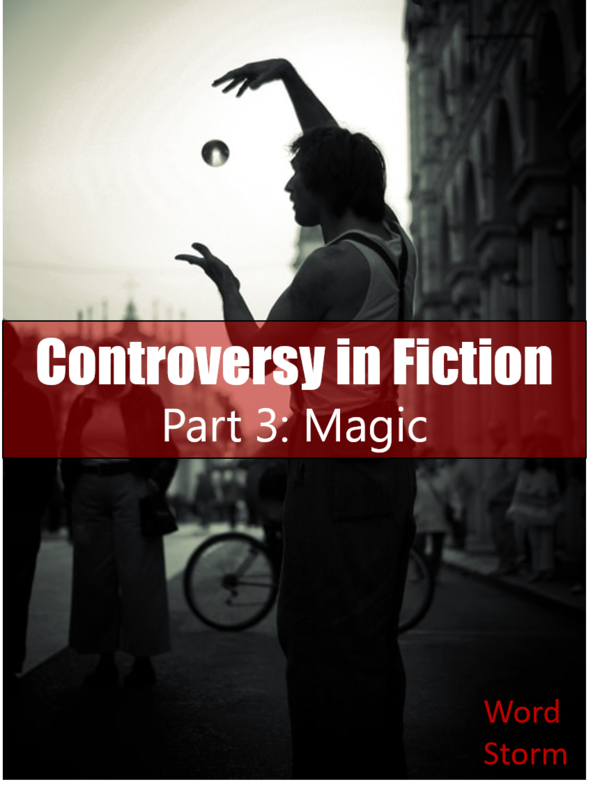 Today I’m excited to share the controversies concerning magic, the fantastical element vital to one of my favorite genres. Disclaimer: This post may contain controversial opinions that are not necessarily the same as those of readers. I have done my best to write objectively and mean no offense to liberals, conservatives, or anybody in between. It was a sunny afternoon in Hawai’i, my mom and I had just returned from the HIM Conference where we got to see David Crowder Band, and I was carrying one of my new acquisitions: that’s right, a pretty little book with a dragon on the cover, DragonKnight. And it was a Christian fiction book; I got it at the conference after all, so nobody thought anything of it. Until we visited the home of a lady from church. She took one look at my book and asked me how I could read that. Didn’t I know dragons were of the devil? She then proceeded to go onto a spiel about how evil they were and how J. R. R. Tolkien couldn’t have been a Christian because he had wizards in his book. I stood there and took it, thanking God she never mentioned C. S. Lewis and how The Voyage of the Dawn Treader included a dragon. I went home that day feeling crushed. But I did the best thing I know I could do: I asked my brother Gavin what he thought. Anybody who knows anything about my brother, knows he’s always been extremely conservative. While I might not always agree with him, I respect many of his opinions. And at fourteen-years-old, I was seeking some assurance on my reading choices. Gavin said that he believed there could be good dragons, and I haven’t looked back since. But that doesn’t mean we haven’t had disagreements over the years. Fantasy happens to be one of my favorite genres, but it is also one of the most debated between conservative and liberal circles. Everybody seems to have their own opinion on magic and whether or not it is purely evil or could be a force for good. Written by C. S. Lewis, the Oxford scholar and author of Mere Christianity and The Screwtape Letters, The Chronicles of Narnia serves not as an allegory of the Bible but rather as a supposal, Lewis term for a hypothetical scenario rather than an event-for-event and character-for-character story of the allegory. Aslan and the talking animals versus the White Witch and her minions represent the spiritual realms, making this series the quintessential for the religious. Yet, the books still contain magic. Magic serves as the primary means by which the Pevensies and the other children get to Narnia, and even Aslan is bound by honoring the Deep Magic through his sacrifice. But it goes further. Dr. Cornelius uses simple magic in Prince Caspian, Lucy reads spells from a book in The Voyage of the Dawn Treader, and Eustace and Jill call on Aslan in The Silver Chair. “That is what happens to those who pluck and eat fruits at the wrong time and in the wrong way. The fruit is good, but they loathe it ever after… She has won her heart’s desire; she has unwearying strength and endless days like a goddess. But length of days with an evil heart is only length of misery”. A fellow Oxford professor and the man who brought Lewis to Christianity, J. R. R. Tolkien’s The Lord of the Rings serves as an influential story that shaped fantasy as we know it today. Although there is no clear, singular Christ figure, the division between good and bad is evident between Sauron’s armies and the free peoples of Middle Earth. Once again, magic plays an important if not allusive role. The One Ring is clearly evil, but even the elves themselves bear rings of power. Likewise, the Palantire could be used for good or bad, the elves and wizards exercise magic, and Aragorn himself commands the power over the King of the Dead. Ultimately, magic has intellectual properties concerning wizards and elves, especially where the elvish language is concerned, and spiritual aspects concerning the rings, which as Gandalf puts it have curious properties. Among the most contemporary of popular fantastical fiction, Christopher Paolini’s The Inheritance Cycle has a well-developed system of magic. Perhaps my favorite thing about the series is magic’s limitations and linguistic properties. Most spells are connected with words, from brisingr (fire) to rïsa (rise), and require a certain amount of energy from the spell caster. It’s actually rather unnerving that some spells, if used too soon or without the proper amount of strength, could kill a Dragon Rider. Unlike the previous stories, only a selected few can use magic from Dragon Riders and dragons to witches and shades. However, there is no particular race or type of magician who is strictly good or bad. Eragon and Saphira ultimately come up against Galbatorix and Shruikan, and while the shade is clearly an antagonist, there are allies who are witches, and even the dreaded Urgals do not all serve Galbatorix. As I was growing up, I wasn’t allowed to read J. K. Rowling’s Harry Potter books because they included wizards and witches as the main characters. But once I graduated from high school, my mom told me I could read anything I wanted because she trusted my judgement. When I first started reading the books, my mom was a little startled and my brother was appalled. As I read the books, I never quite agreed with all the witchcraft and spells, but I still appreciated the books for its world building and many of its characters. Magical abilities in these books are passed down through generations or simply appear for others. Then each wizard or witch is taught how to use magic in schools such as Hogwarts. But there’re still forbidden spells and the dreaded Lord Voldemort. Essentially, it’s yet another fight between light and dark. Or as the book puts it, English and Faerie Magic. While Norrell advocates for intellectual learning and polite, English magic (talking gargoyles, weather illusions, etc. ), Strange experiments with Faerie Magic (The King’s Roads, Faeries themselves, and anything dealing with the Raven King) or Black Magic (raising the dead and causing madness). I read this book on my own so I could form my own, untainted opinions on it. Here goes. The struggle between Strange and Norrell serves as a primary conflict throughout the book, but neither of them can be said to be particularly bad, although they have their faults, namely arrogance and selfishness. At the same time, the Faeries themselves are devious and act as the primary cause of most of their troubles. Of course, these categories are not absolute. In fact, trying to catalogue the different types of magic almost drove me mad (thankfully, not the Jonathan Strange, pineapple-hating mad). There’s no reason to say that Narnian magic doesn’t have a science to it. After all, the Pevensies come up with an explanation to figure out the differences in time elapse between Narnia and England. Similarly, the characters in Harry Potter clearly have souls, for without them the Dementors would be purposeless. Even an afterlife is alluded to several times. The main problem audiences tend to have with the different types of magic depends on their perception of it. To some people, all magic is evil. To others, if the magic doesn’t align with their spiritual views, it’s bad. In fact, many Christians I know tend to prefer the spiritual aspects of The Chronicles of Narnia over other forms of fantasy. Others yet may believe it’s all just fiction anyway, so the same principles of fiction don’t apply to fantasy as they do in the real world. Although my brother Gavin still refuses to read, watch, or talk comfortably with people concerning Harry Potter, he still likes fantasy. In fact, he uses Once Upon a Time’s terms for magic: light and dark. Essentially, it seems most fantasy abides by these principles. Every struggle between magical forces is more often than not a struggle of good versus evil, light versus dark. That isn’t to say that either side is strictly pure (Edmund betrayed his siblings and Eustace was turned into a dragon; Harry used forbidden spells; and basically every member of the fellowship was tempted by the Ring), but even magical worlds strive for a sense of justice and moral standards. I once heard it said that magic can be a metaphor for power, and it’s true to a sense. Some people are granted more power than others, some inherit it, and others don’t. But each person can choose to use that power, for good or for ill. And in that sense, because fiction itself holds a sort of power, words themselves can be magical. Literary References: Donita K. Paul’s DragonKeeper Chronicles, J. R. R. Tolkien’s The Lord of the Rings, C. S. Lewis’ The Chronicles of Narnia, Mere Christianity, and The Screwtape Letters, Christopher Paolini’s The Inheritance Cycle, J. K. Rowling’s Harry Potter series, and Susanna Clarke’s Jonathan Strange & Mr Norrell. Let’s chat! What’s your stance on magic? Of the above types, which do you prefer? Excellent article, Azelyn. I have often wondered why some Christians are so adamant against magic in fiction. I've even had someone tell me that the "spells" in the Potter books are real spells and we shouldn't be saying them aloud. Good grief. We better stop taking Latin classes or we might inadvertently say "Light!" in Latin and make all the lights go on. About Tolkien's lack of a singular Christ-figure, it should be noted that he did a superb job of giving us three: Gandalf, Frodo, and Aragorn. These three represent the three aspects of Christ: prophet, priest, and king. Thank you for the comment, Lisa. I'm glad you enjoyed the post. And you have are some interesting points to consider. I haven't analyzed TLotR nearly enough! Perhaps I'll do a post sometime on Christ-figures throughout fiction.